Refers to an improper relationship between the jaw and the skull. TMD may lead to a cascade of symptoms varying from patient to patient. A clicking or popping of the jaw on opening or closing. Pain in the face, shoulder or neck. Tinitis or ringing in the ear or earache. Fracture and/or abfraction of teeth. Generalized, transient sensitivity of teeth. Some causes of TMD may be untreated orthodontic conditions such as; over or under bites, bruxism (grinding teeth), or a traumatic injury to the head or neck. Here you can learn about a variety of Dental topics. This Dental Education area was designed to help our patients become better informed. Topics discussed here are issues that Dr. Torre and her staff believe are important to your overall health and well-being. Take your time reading each section or simply click on one of the topics below to take you directly to an area of interest. 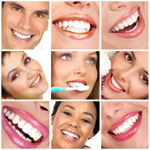 There are many precautions one may take to avoid injury to your teeth, lips, cheeks, and tongue. Wearing a mouth guard while participating in contact sports. Avoid chewing hard substances such as fingernails, pen caps, hard candy, popcorn kernels and ice. Do not use teeth to tear open packages or wrappers or to hold any objects in. If you do find yourself or your child in an unavoidable emergency situation, we do offer emergency appointments that are part of our daily schedule. Please call the office as soon as possible after a perceived dental accident. Your prompt attention could mean the difference between saving and losing a tooth. You should clean the area gently with a moist cloth and apply a cold compress. If bleeding is present and does not stop go to the hospital emergency room immediately. If swelling is present apply a cold compress and call the dentist office immediately. Gently try to remove the object with dental floss. Do not stick any foreign objects between your teeth. If you are unable to remove with floss call the dentist. Do not touch the root of the tooth. Hold the tooth by the crown and rinse if it is dirty. Do not scrub the tooth or try to remove anything from it, except dirt from it. If you can re-insert tooth into socket do so. If not place in a cup of milk and bring it with you to the dentist as soon as possible, time is of the essence! Try to clean the area by rinsing gently with water. Do not put aspirin or any other pain medication on the area as this may burn the adjacent gum. If pain is persistent, contact the dentist office immediately. For decades, the American Heart Association (AHA) has recommended that patients with certain heart conditions take antibiotics shortly before dental treatment. This was done with the belief that antibiotics would prevent infective endocarditis (IE), previously referred to as bacterial ednocarditis. IE is an infection of the heart’s inner lining or valves, which results when bacteria enter the blood steam and travel to the heart. Bacteria are normally found on the skin and in the mouth. The AHA’s latest guidelines were published in its scientific journal, Circulation, in April 2007 and there is good news: the AHA recommends that most of these patients no longer need short-term antibiotics as a preventive measure before their dental treatment. The new guidelines are aimed at patients who would have the greatest danger of a bad outcome if they developed a heart infection. The new recommendations apply to many dental procedures, including teeth cleaning and extractions. Patients with congenital heart disease can have complicated circumstances. They should check with their cardiologist if there is any question at all as to the category that best fits their needs. As with any surgical procedure, some discomfort, swelling or bleeding might occur. These instructions will help you the first few days following your procedure. As always, the Doctor is very interested and very available to you, so please don’t hesitate to call if you are concerned about the after effects of your dental procedure. Bleeding is best controlled by the use of pressure. Bite on a piece of gauze or a tea bag. Do not use coffee. Place directly over the surgical site for a few minutes. Avoid vigorous rinsing, spitting or sucking through a straw the day of surgery because it result in additional bleeding. If stitches have been used, they will usually be removed in a week. Avoid physical excretion or exercise for at least 48 hours. It is very important to take all your medications as directed. Antibiotics need to be taken on schedule supplied. Be sure to finish the whole prescription to avoid more resistant bacteria which may grow back faster and stronger. Ice packs can be applied to the face over surgical area to reduce swelling and bleeding. For best results, apply the ice pack 20 minutes on and 20 minutes off. Never apply heat. Choose soft non-spicy foods that are neither too hot nor to cold for a day or two. Avoid alcoholic beverages and please do not smoke. Resume a normal diet as soon as you feel comfortable doing so. Do not brush near the surgical area or use a non-prescription rinse for 24 hours because it may disturb healing. After 48 hours, rinse gently with warm salt water, three to 4 times daily. Clean the rest of your mouth normally. Some discomfort may be expected after a surgical procedure. The amount will depend on the extent and type of surgery performed. Use Ibuprofen (such as Advil), Naproxen (Aleve), or Acetaminophen (Tylenol), following the package directions as needed. If the pain does not resolve please call the office. Moderate to server discomfort may require a prescription medication. With a narcotic medication do not drive or operate dangerous machinery. If swelling interferes with swallowing or breathing, forces your eye(s) to close, if you develop a rash, vomit, faint or have a temperature over 102 degrees, please call the office (508)228-2699 for emergency information. If it is after hours, please go to your local hospital emergency room. On behalf of all of us at Old South Dental, feel better soon! If you use a bisphosphonate medication – to prevent or treat osteoporosis (a thinning of the bones) or as part of cancer treatment therapy-you should advise your dentist. In fact, any time your health history or medications change, you should make sure the dental office has the most recent information in your patient file. Some bisphosphonate medications (such as Fosamax, Actonel, Boniva) are taken orally (swallowed) to help prevent or treat osteoporosis and Paget’s disease of the bone. Others, such as Aredia, Bonefos, Didronel or Zometa, are administered intravenously (injected into the vain) as part of cancer treatment to reduce bone pain and hypercalcemia of malignancy (abnormally high calcium levels in the blood), associated with metastatic breast cancer, prostate cancer and multiple myeloma. In rare instances, some individuals receiving intravenous bisphosphonates for cancer treatment have developed osteonecrosis (pronounced OSS-tee-oh-ne-KRO-sis) of the jaw, a rare but serious condition that involves server loss, or destruction, of the jawbone. A periodontal examination will be part of your general dental check-up. A small instrument called a periodontal probe will be used to gently measure the space between your tooth and gums. Each tooth has 6 locations where this will be measured. The measurement taken relates to how much, if any, bone loss has occurred at each site. Bone loss is caused by periodontal disease. This exam will be performed at subsequent visits in order to monitor periodontal and gingival health. Gingivitis is the first stage of periodontal disease. It is marked by plaque and bacteria build-up in the mouth leading to inflamed gingiva with easy bleeding. Probing measurements are generally 3mm or less in depth and show no bone loss. Periodontitis is initiated when plaque is not properly removed through daily tooth brushing and flossing. If plaque remains on teeth too long it will form a harder more difficult to remove material called tartar or calculus. The presence of tartar and plaque accumulation will eventually lead to gum recession. The pocket between tooth and gum will be larger and filled with bacteria and pus. Gums will bleed very easily, will be irritated and red. If left untreated bone loss will be present and may lead to destruction of gum tissue and loss of teeth. Periodontal infections can be serious and can affect not only the mouth, but your systemic health as well. Periodontal disease may be avoided if daily oral hygiene habits and regular dental cleanings are followed. If the disease is not caught in the early stages periodontal cleanings or in advanced cases surgery may be necessary.